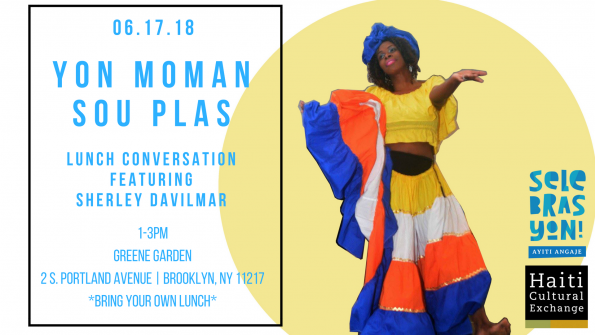 Join HCX and Lakou NOU 2016 Artist Resident, Sherley Davilmar as she host an Atis Angaje lunch conversation discussing the work that she did during her “How Desensitized Are We?” residency project. She’ll be focusing her talk on the intersections of health and wellness, gentrification, and violence in our communities. She’ll be opening a space to forum and form creative strategies among ourselves. DATE/TIME: Sunday, June 17th | 1-3pm. This entry was posted on Monday, May 14th, 2018 at 11:49 am	and is filed under An n' Pale, Archive, Public Forums, Selebrasyon!, Social Justice. You can follow any responses to this entry through the RSS 2.0 feed. You can leave a response, or trackback from your own site.